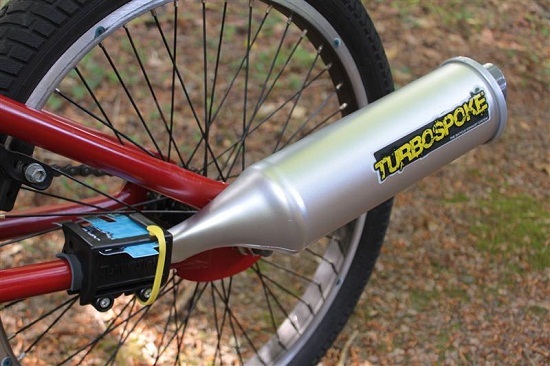 Turbospoke Bicycle Exhaust System | OhGizmo! TurboSpoke utilizes durable “Motocards” and an effective clamping and amplification system to make your bike roar like a four stroke engine. Each TurboSpoke comes equipped with three waterproof Motocards, which each produce a different engine sound when struck by the spokes of your bicycle. The lightweight and durable exhaust “pipe” acts like a horn to increase the volume produced by the Motocard. It’s a stupid little toy, but it’s fun nonetheless. At $24, it’s a cheap gift for a child of any age. Each TurboSpoke attached to the bike and its effects, we can truly see and use.